Valeri Vladimirovich Bure was born on the 13th June 1974, in Moscow, Russia, (then the USSR) and is a former Russian-American professional ice hockey player widely known as the right winger of NHL’s Montreal Canadiens, Calgary Flames, Florida Panthers and St. Louis Blues teams. Have you ever wondered how much wealth this talented sportsman has accumulated so far? How rich Valeri Bure is? According to sources, it is estimated that the total size of Valeri Bure’s net worth, as of mid-2016, is $10 million which has been acquired mostly through his hockey career which was active between 1990 and 2004. Valeri was born the younger brother of NHL Hall of Fame inductee, Pavel Bure, so it is no wonder that he followed his brother’s steps and became a successful hockey player. Prior to moving to Canada and joining Spokane Chiefs in the Western Hockey League, Valeri played one season of junior hockey in the Soviet Championship League under the colors of CSKA Moscow. In his rookie season for the Chiefs, Valeri scored 49 points in 53 games, and his potential was recognized by the Montreal Canadiens when he was drafted #33 at the National Hockey League Entry Draft. During the 1992-93 season which Valeri spent with the Spokane Chefs, he scored 147 points in total, and with 68 goals, he still holds the Chief’s franchise seasonal record. These engagements provided the basis for Valeri Bure’s future hockey career as well as for his net worth. Valeri Bure’s professional career officially began when he joined the Canadiens for the 1994-95 season. After three years spent in Montreal, Valeri was traded to Calgary Flames, and soon after joining the team, due to his irrepressible scoring ability, he placed himself among team’s top scorers. Valeri was selected for the World team at the All-Star Game in 2000, when he played alongside his brother Pavel. These accomplishments certainly positively impacted the overall wealth of Valeri Bure. In 2001, Valeri Bure transferred to the Florida Panthers, where he stayed for the next two seasons, although the majority of the time he spent on the sideline due to a series of injuries. 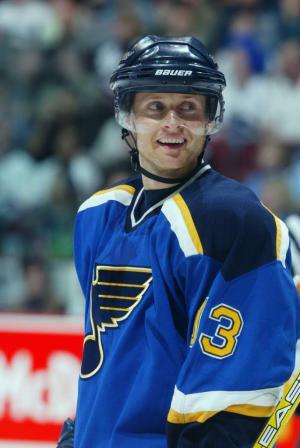 In 2003 he moved again, this time to the St. Louis Blues. However, he returned to the Panthers for the 2004 season which, as it later turned out, was his last as well as the peak performance season in the NHL, during which he earned $3.1 million, adding a significant sum to his net worth in total. Apart from NHL, Valeri Bure has also played for the Russian national team, firstly as a junior at the World Junior Championship in 1994, when they won the bronze medal, and later in the 1998 Olympic Games, helping his fellow countryman to win the silver medal. Before retiring from professional hockey in 2004, Valery Bure wore the national jersey one more time, in the 2002 Winter Olympics held in Salt Lake City when Russia finished with the bronze medal. All these involvements have contributed to Valeri Bure’s wealth. When it comes to his personal life, Valeri Bure has been married since 1996 to Candace Cameron, an American actress, producer and author with whom he has 3 children; they currently reside in St Helena, California. In 2007, Valeri and Candace opened a restaurant in Florida called The Milk and Honey Cafe, but abandoned the business shortly after. Subsequently, Valeri invested in the wine making business and currently operates the Bure Family Wines in the Napa Valley. Valeri Bure has also taken part in the Battle of the Blades in 2010, a figure skating reality show, in which he and his partner Ekaterina Gordeeva, won the main prize of $100,000 that was donated to charitable causes. 3 His great-grandfather was watchmaker to Czar Aleksandr III. 4 Son-in-law of Robert Cameron and Barbara Cameron. 5 Brother-in-law of Kirk Cameron, Chelsea Noble, Melissa Cameron and John Ridenour. 6 Played for the Spokane Chiefs of the Western Hockey League from 1991-1994. 7 Traded to the St. Louis Blues by the Florida Panthers for minor league defenseman Mike Van Ryn, March 11, 2003. 8 His family made precious watches for the czars from 1815-1917. The dynasty's founder, Swiss-born Eduard Bure, is said to have been the first watchmaker to attach a tiny strap to a watch so that it could be worn on the wrist. Since 1996, Pavel Bure, has attempted to resurrect the business, presenting 3 gold replicas of the company's last model to Boris Yeltsin, Victor Chernomyrdin and Yuri Luzhkov. 10 Traded from Calgary to Florida on June 23, 2001 along with Jason Wiemer in exchange for Rob Niedermayer and a second round pick in the 2001 NHL Entry Draft. 13 Acquired from Montreal Feb. 1 1998 in exchange for Zarley Zalapski and Jonas Hoglund. 14 Younger brother of NHL superstar Pavel Bure. 15 Valeri and Pavel learned English from TV and radio after coming to the United States with their father in September 1991. 16 Recorded two assists on two of Pavel's three goals for the World Team in the 2000 NHL All-Star Game, setting a new mark for the most points by a brother combination in an All-Star Game (6: Pavel 3-1-4; Valeri 0-2-2). They were the 12th pair of brothers to play in the same All-Star Game and the 8th to play on the same team. 17 1999-2000: He and Pavel set a new record for most goals by brothers in an NHL season with 93 (Valeri, 35; Pavel, 58), breaking the old mark of 88 set by Bobby and Dennis Hull in 1968-1969. 18 Nickname "The Pocket Rocket" is a play on Pavel's nickname "The Russian Rocket"
19 He and wife Candace Cameron Bure have 3 children: Natasha Valerievna Bure (born 15 August 1998), Lev Valerievich Bure (born 20 February 2000) and Maksim Valerievich Bure (born 20 January 2002). 23 His father, Vladimir, competed as a swimmer for the Soviet Union in the Olympics, winning bronze in 1968 (4x200m freestyle) and 1972 (100m freestyle; 4x200m freestyle). He won 2 Stanley Cups with the New Jersey Devils in 2000 and 2003 as the team's fitness coach.